I love a lot of things and one of them is a good Show House. 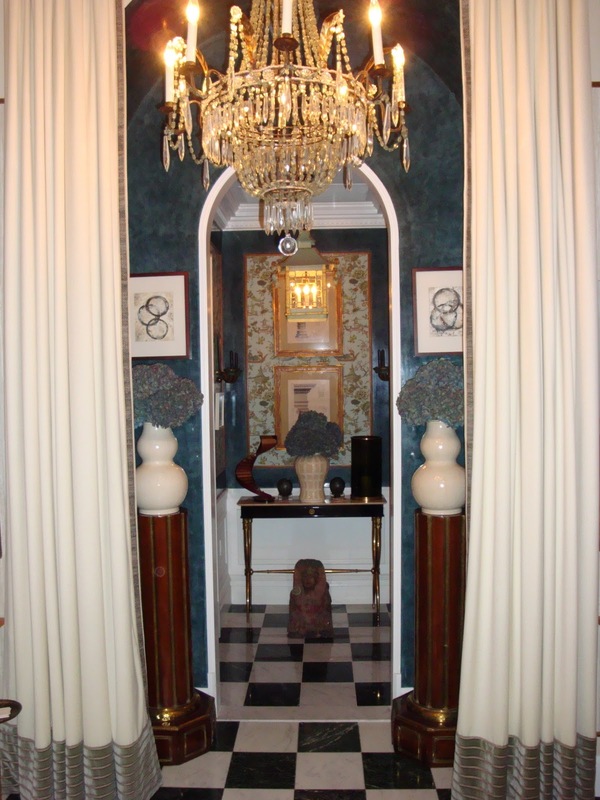 In my opinion the Kips Bay Show House is the "Godfather" of Show Houses. I go to see what those clever New York designers are doing and if I take away a few ideas; all the better! I thought this year's house showed a lot of interesting, quiet subtlety. Eve Robinson's kitchen wowed me. 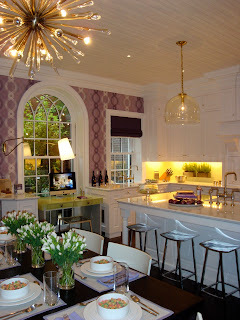 I loved the unexpected color and wallpaper. The lighting was spectacular but she "had me" at the ceiling. The kitchen makes a great design lab! Always think about the importance of your entrance. It's everyone's first impression of what's to come. Hallways and niches are great, unexpected places to explore. Vincent Wolf did a great job at defining the different seating areas (above) as did Sherrill Canet (below). She also did something I liked that is very easy to try at home. The walls are painted all one color, in this case blue, but any color works, then a clear gloss was used to create a striped looked. Simple and effective. 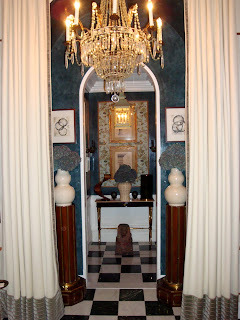 You have read this article designer show house / Kips Bay 2010 / Show House with the title Kips Bay Show House 2010:Part Un. You can bookmark this page URL http://ourpicturewindow.blogspot.com/2010/10/kips-bay-show-house-2010part-un.html. Thanks! 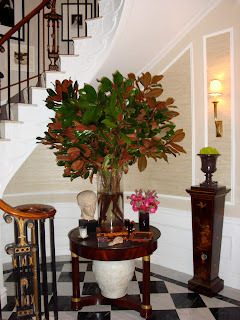 No comment for "Kips Bay Show House 2010:Part Un"